It has been confirmed tonight that Hemel Hempstead Town FC captain Jordan Parkes has joined National League South big-spenders Ebbsfleet United for an undisclosed fee. 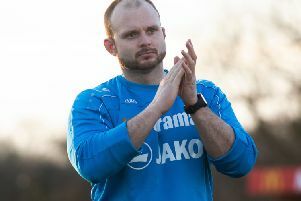 Hemel manager Dean Brennan revealed earlier this month that Parkes had turned down an improved contract offer with the Tudors, and his departure from Vauxhall Road is now official. It’s been a very tough decision to make but it’s the right move for both me and Hemel Town FC. The 25-year-old enjoyed an exceptional campaign last season, scoring 30 goals in all competitions including a textbook free-kick against Ebbsfleet at Stonebridge Road in February. Speaking on his Facebook page, midfield maestro Parkes said: “As you may have seen, I have signed for Ebbsfleet United tonight. “I’ve had a brilliant three years captaining my home town club Hemel Town; getting promotion and reaching the first round of the FA Cup have been highlights that I will never forget. “Thanks to Dave, Deano, Maynard, Holmesy, Booney and above all the fans who have been brilliant to me both on and off the field. It’s been a very tough decision to make but it’s the right move for both me and Hemel Town FC.